In March 2011 my Dad was diagnosed with vascular dementia, in the following October he discovered he also had inoperable lung cancer. With a prognosis of 12 months and two terminal conditions, he still manages to struggle on. Those that know me, have seen that the protracted and gradual loss of my father has had a profound affect on me. Unable to mourn him, I instead have to watch him slowly loose his dignity and identity. This form of loss is something that many people experience and with an ageing population it will become one of societies greatest challenges. Beyond the emotional, medical, economic and social problems dementia presents, I think it’s important to reflect on what we can learn from those that are loosing purchase on reality. To understand, when our mental lives are slipping away, what do we grasp onto. To reflect on how our actions in the world today may shape the way we react to this terribly cruel disease, if we’re unfortunate enough to succumb to it. It’s a common myth that dementia is purely about memory loss. The most common response from someone finding out about my Dad is; ‘Does he still recognise you?’. The answer is yes, identifying his family has never been a problem. However, he’s also completely insane. I mean in a proper ‘One Flew Over The Cuckoo’s Nest’ way. Dad lives in an alternative reality — his perception of the world, his role and agency within it are fully fictional. He spends most of time living in a different time, but his new reality is saturated with the media of today. Most recently, he’s been obsessed with my Mother having an affair and being pregnant by Simon Cowell. My Mum is 68 and has never met the renowned R&R executive. His anxieties are re-lived in a perpetual loop, he’s stuck, replaying fragments of a fictional life. Insanity, is something that people are very uncomfortable with, ‘forgetfulness’ is far easier to understand and ignore. Seeing dementia suffers as old people that forget names, faces, where they live, gives us a way to empathise with them without feeling threatened or terrified. Sadly, the reality is far more disconcerting. Believing you are in a different place, time and space, doing tasks that are never complete, battling demons that never show themselves is a far darker place to be. Last week I attended Improving Reality. I throughly enjoyed listening to smart people discuss the possibilities of change within our socio-technical complex. However, as with many provocations, the word REALITY, once said over and over started to loose meaning and impact. I left the day with only a scant understanding of my own reality, never mind the opportunities to improve it. In talking about design, I often use language about ‘reality’, ‘change’ and ‘alternatives’ with little scrutiny about what we actually understand as the representation and manipulation of our reality (or realities). When confronted with a group of people who live and perceive the world differently, you can start to understand the role of media, narratives, conversations and relationships in a different light. My Dad’s reality is his reality, through gentle conversations you can start to uncover the boundaries of his world, you can give texture to the everyday frustrations of living apart from the rest of us. The reason I started writing this post was an overall sense of sadness about my Dad’s room in his care home. In their original states, the rooms are scantly decorated, institutionally bleak, to allow residents and their families to ‘make it home’. Most rooms have trinkets and ornaments, photographs and keepsakes, scatter cushions and familiar furniture. Everywhere around the care home you see evidence of residents’ families making efforts to remind their loved ones of who they once were, hoping that the objects they once loved would somehow create an anchor to this reality. My Dad’s room is empty. Even the draws are empty. 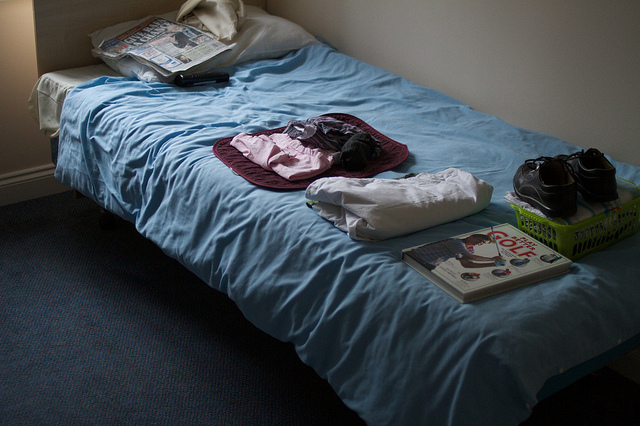 It looks like a hotel room on the morning that you leave; signs of life, but one of transience and departure. The lack of stuff in my Dad’s room is due to his capacity to distribute his material possessions to the furthest (and strangest) parts of the home. Within 24 hrs any object that enters his room (including his false teeth!) will disappear. I sometimes wonder if his rejection of his possessions are in someway a protest to the reality he finds himself in. By repelling his belongings he can keep a distance from the place he finds himself, seeing it as a temporary stop-over before he returns home. Dad has always been a very un-sentimental man, he has little time for reflection and reminisce. Whether through friends, photographs or objects, he has lived his life in the perpetual present, loving new experiences and carrying little with him. This approach to life has in someway become amplified through his dementia. Sadly, he isn’t left with the positive affects of his life philosophy, only the negative. He has become obsessed with the idea of someone stealing his things. He’s also turned his hand to occasional larceny. Many residents in the care home also appear to be obsessed with the loss and theft of their possessions. Obviously, as a family member your first reaction is to worry about members of staff abusing their positions of power. Recent media coverage has done little to build the trust you feel for care homes. I’m sure that theft and abuses of power occur, but in this instance, I don’t believe it’s the case. I think this phenomena is linked to the relationships we build with commodities. Contemporary living seems to be largely based around the collection and consumption of material things, much has been written on the psychological effect of our modern obsession. But it is when sanity is stripped away, we see the unsettling remainder of conspicuous consumption. Material possessions give little solace to my Dad, instead he’s left with anxiety and paranoia. When all the glitz and glamour gone, we’re left feeling hollow. I’ve been approached countless times by the residents clutching small collections of objects muttering about someone stealing something or things being lost. On Wednesday, an elderly man approached my holding a nail file, an elastic band, some scissors and an Ikea pencil. These things hand been stolen from him, he’d being trying to find them all day. No matter what objects enter the care home, they’re consumed on the same level. Semiotic chains of meaning are disrupted and broken. Objects are washed up on the shores of memory as fragmented links to a reality long lost. All of this has made me try to rethink how the meanings of things are created and maintained. How do I select the things that I hold dear to me? What will these things mean if I suffer the same loss of reality as my father? And most importantly, if I loose my grip on reality, will I be left with a continual and unsettling feeling of material loss? If so, how do I live my life to strengthen and nurture relationships with people and not things. I felt like reading this again Matt. People not things. Powerfully put.